Yoga philosophy: Yoga is the creative process that grows out of the desire (or need) to better understand health and the human condition. Yoga is often understood as the benefits derived from physical and mental exertion and control. Part I of the program opens yogic curiosity to all avenues of inquiry (including: physical, intellectual, scientific, artistic, emotional and social) and how each of these inquiries contributes to health, personal growth and deep change. Rather than focus on memorization and recall of information, participants gain a deeper understanding of the principles and processes of yoga through exploration and experimentation. Understanding that the foundation of yoga is inquiry (not accomplishment) not only enhances personal practice, but also carries over to the highest quality of instruction. Participants will have many opportunities to step into the role of instructor as the program emphasizes the “each one, teach one” principle. We will explore a variety of yoga styles (Kundalini, Pilates, Ashtanga and Bikram) as well as look at psychology and other modalities of therapy. Each participant will choose which style of yoga to focus on for their instruction. A diverse reading list further explores growth and human potential. Teaching philosophy: The analogy of yoga as nutrition helps elucidate the program’s teaching philosophy. Just as a person benefits from eating a vegetable, a person benefits from exploring a yoga pose. And like a vegetable, the benefit of each pose varies depending on how it is prepared, combined with other posses and consumed. Attending different styles of yoga is like going to restaurants of different ethnicities, each with its own benefits. There can be great benefit from attending a well-prepared yoga class, but eventually deep change and health require a responsiveness/creativity that only comes with cooking for oneself. With yoga, this means feeling within for what is appetizing, exploring a pose until the appetite is satiated and/or curiosity draws one to another pose. The Art, Science and Athletics of Inquiry is akin to a school for the culinary arts: a place to play with heat and subtlety and expand into the art of cooking for one’s self. In its deepest simplicity yoga is adventure, a fully creative process that only requires curiosity and a handful of basic tools. Yogatorium – Interactive Exhibits: I have developed several unique interactive exhibits to help understand the anatomy of movement and breath. An arm device allows participants to move the biceps muscle to different insertion points along the forearm to discern the advantages and disadvantages of each position and better appreciate joint ingenuity. A model of the lower extremities allows one to measure the enormous forces involved in toe balances and bent-knee poses. Another device elucidates the liquid nature of the gut and how the pelvic diaphragm and abdominal muscles (core strength) are used in different types of breathing. Also, the dissection of a goat will be included as part of The Art, Science and Athletics of Inquiry to understand one’s anatomy. This part of the program is highly recommended but fully optional for participants. Teacher’s Bio: I have 40 years meditation experience, a 29-year yoga practice and 15 years experience as a yoga instructor. Besides the yoga program, I have also created exploration-based curricula for math and language. I am trained in Swedish massage. Massage and acupressure will be incorporated in the program. I have turned two writing projects into handmade books: Mom, How do I Think: questions, ideas and activities for parent and child. And a wood and leather bound campfire story entitled, Earth Skills. The program will play with many of the ideas and explorations of my current manuscript, Yoga for Hunter’s: the nature of change and the essence of human turmoil. I have had an active kundalini for the past decade. BA in Linguistics from UC Berkeley, 1985. National Championship in Lightweight Crew, 1984. I started yoga with Brad in October of 2009. Since then, my body has transformed and my appreciation and understanding of myself – specifically of my health, my body and my breath – have increased like never before. 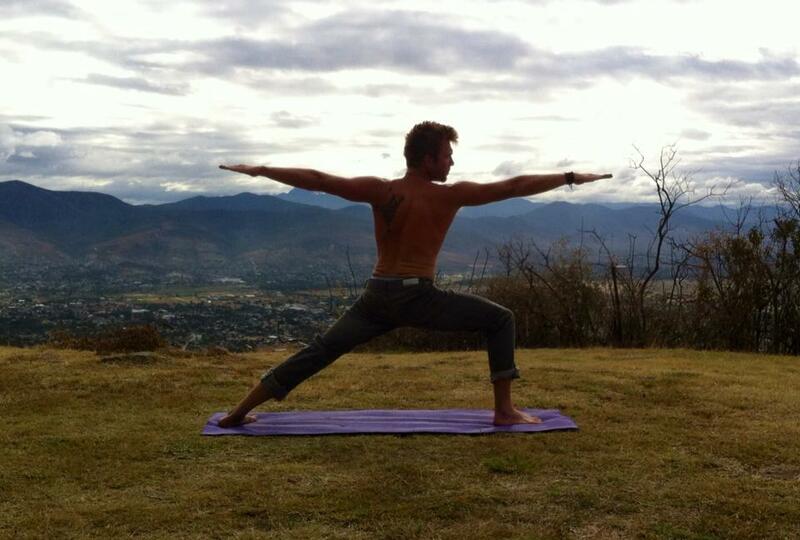 Brad facilitates the exploration of the fundamentals of yoga in a wide range of yoga practices. His knowledge of anatomy and kinestheology are outstanding, and his teaching is accessible to everybody. I participated in the 200 hour program in 2011 and I continue to be excited to learn from him. Brad has so much to share. Brilliance is not knowing the answer, but willingness to explore the question. Meditation/Foundation: Attaching awareness to the breath. Using sound as biofeedback (voiced and whispered alphabet, Spanish vowels). Using the breath to energize the “bandhas” and generate healthy alignment. What is Yoga? The different types of curiosity and how they influence learning. Personal Range of Comfort/Action: heat/vitality, soft/quiet, emotional/ intellectual. What topics are safe to talk about? Approaches to Understanding Human Potential: The Art of Inquiry. The Science of Inquiry. The Athletics of Inquiry. Introduction of Projects to be worked on over the next 3 weeks: List 10 things that are important to you. List the uses of language and conversation. What do you want from this program? What do you want from the next 5 years? What is Language? Create 3 ways to explore breath. Create 3 ways to explore attention. List Characteristics of Human Nature and Outline Stages of Personal Development. Class: Ashtanga – Modified Primary Series. Class: Soft floating movement through Temple Dance and Tai Chi movements. Seated Poise. Standing Poise. Extending Poise to create “Poses”. -Understanding and appreciating Bones and Joints. Meditation/Foundation: Exploration of Attention. Yoga for Hunters. Savasana. Blindfolded Ambulation. Heating the Breath. Breath orchestrated movement. Layout of Mats. Yoga Instruction: What, How and Where do you feel it? Exploration of a pose: Downward Dog. Building poses from the ground up, from the extremities in, and from the core out. Muscles – Begin to add muscles to personal project. Meditation/Foundation: Sweetness in and behind the eyes. Depth of surrender. Power in contraction/health in softness. -Anatomy: Types of Joints. Muscles of Back and Belly. -Pose Clinic: Salutations. Lifting and lowering on the Breath. -Participant Selection of poses from MPS for Pose Clinics: What to do, How to do, Where do you feel it? Primary Extension of each pose. Discussion of modifications. Exploration of Breath, Bandhas (poise) and Drishti (eye gaze). -Nature, Cycles of Similarity, Stasis vs. Change. Meditation/Foundation: “Acupressure for Lovers”. The Piriformis Muscle and Sciatica. Partner Acupressure. -What can be noticed only when paying attention? -Voice Work: Across room. Solo in Circle. -The Pleasure Cycle: Excitation and Release. Optional Program: Participants are invited to continue the Vipassana Mediation throughout the next 2 days. Lecture/Projects: -Chakra System? (basic needs, sexuality, interaction with world, compassion, dissolving of self, speaking ones truth to self and to others, seeing clearly, ultimate connection). -Leading a Yoga Class: What makes a good instructor? Different types of instructors. Nothing has to happen. Don’t need to teach yoga. Let yoga do the teaching. Voice, demeanor, getting people’s attention, handling questions. -Open Forum: for questions, personal projects, etc. -Discussion of Different Styles of Yoga: Anusara, Shadow Yoga, Yin, Rocket Yoga, Iyengar, etc. – Discussion of family and social dynamics and value of different types of therapy: Cognitive Therapy, EMDR(eye movement desensitization and reprocessing),Linguistic Reprocessing, Enrollment Therapy, etc. -How to begin teaching: Private? Family? Own Studio? etc.